Three Rivers Press, 9780385347051, 416pp. 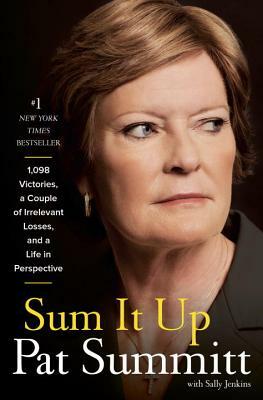 Pat Summitt, the all-time winningest coach in NCAA basketball history and bestselling author of Reach for the Summitt and Raise The Roof, tells for the first time her remarkable story of victory and resilience as well as facing down her greatest challenge: early-onset Alzheimer's disease. Pat Summitt was only 21 when she became head coach of the Tennessee Vols women's basketball team. For 38 years, she broke records, winning more games than any NCAA team in basketball history. She coached an undefeated season, co-captained the first women's Olympic team, was inducted into the Basketball Hall of Fame, and was named Sports Illustrated 'Sportswoman of the Year'. Pat's life took a shocking turn in 2011, when she was diagnosed with early-onset Alzheimer's disease, an irreversible brain condition that affects 5 million Americans. Despite her devastating diagnosis, she led the Vols to win their sixteenth SEC championship in March 2012. Pat continued to be a fighter, facing this new challenge the way she's faced every other--with hard work, perseverance, and a sense of humor. PAT SUMMITT became head coach of the Tennessee Lady Volunteers in 1974; since then she achieved an astounding .843 average and won 8 national championships. She was the first coach in NCAA history to reach 1,000 wins. She lived in Tennessee with her son, Tyler. SALLY JENKINS is the author of #1 New York Times bestseller It's Not About the Bike. Her other 8 books include The Real All-Americans: The Team That Changed a Game, a People, a Nation, and The State of Jones. Her work has been featured in Vanity Fair, GQ, and Sports Illustrated. A native of Texas, Jenkins graduated from Stanford and lives in New York City. "I have admired Pat Summitt for many years. To me, she epitomizes what it means to be a coach. Not only has she molded championship teams, but she has helped her players grow as people and always done it with class and dignity. This book gives us tremendous lessons for winning on and off the court." -Tony Dungy, former professional American football player and NFL coach, and #1 New York Times bestselling author of Quiet Strength and Uncommon. "Pat Summit was one of the best coaches ever, and one of the most enduring...She helped lift her sport out of an era in which high school girls didn't even play on a full court, saw the number of female college athletes rise from 16,000 to almost 20,000, won eight national titles, and gradduated 100 percent of the players who completed their eligibility. She did this through force of personality and, in her own telling, with a mix of love, fury and manipulation...As scandals and player lawsuits make college sports seem increasingly ruthless and suspect, Summitt is often held up as a rare example of dignity and class." "Pat is a remarkable leader, lady, and Coach. One of the best of all time." -Rick Pitino, Head Basketball Coach, University of Louisville. "How many times have we heard a basketball fan utter that’s “the truth” when witnessing a great play or player? This book IS the truth, capturing the reality of challenges, the blessings of friendship and teamwork, the exhilaration of achieving excellence, and the rewards of mentorship and leadership."